This global partnership investigates the opportunity provided in environmental impact assessments (EIAs) to influence the extent to which health issues could be addressed in the design and delivery of mining projects. 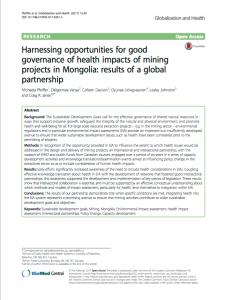 With the support of WHO and public funds from Canadian sources, the partnership engaged over a period of six years in a series of capacity-development activities and knowledge-translation/dissemination events aimed at influencing policy change in the extractives sector so as to include consideration of human health impacts. Authors: Michaela Pfeiffer, Delgermaa Vanya, Colleen Davison, Oyunaa Lkhagvasuren, Lesley Johnston and Craig R. Janes.